Back cover blurb: Jenny’s wounds have healed. An experimental treatment has removed the memory of a horrific and degrading attack. She is moving on with her life. That was the plan. Except it’s not working out. Something has gone. The light in the eyes. And something was left behind. A scar. On her lower back. Which she can’t stop touching. And she’s getting worse. Not to mention the fact that her father is obsessed with finding her attacker and her mother is in toxic denial. It may be that the only way to uncover what’s wrong is to help Jenny recover her memory. But even if it can be done, pulling at the threads of her suppressed experience will unravel much more than the truth about her attack. And that could destroy as much as it heals. 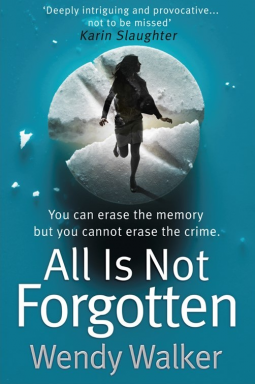 All Is Not Forgotten is a very clever novel that really explores what happens to our brains when we are faced with traumatic events from our past. Jenny is just Sixteen years old when she is brutally sexually assaulted at a party and left for dead in the woods. Her parents are naturally concerned for their daughter and agree to her being given a drug that will help her forget the events of that fateful evening. But Jenny has a scar that she can't stop touching. Jenny seems to be moving on with her life until one day things come to a head and those around her who love her, realise that perhaps the only way for Jenny to truly move on, is to help her relive the past. No matter how shocking, painful or disturbing that might be. This is the point at which we meet the novel's narrator, Dr. Alan Forrester, Jenny's psychiatrist. Dr Forrester has a personal interest in Jenny's case, details of which are slowly drip fed to the reader throughout the novel. Only serving to heighten the suspense. Saying much more about this novel, would only spoil it for future readers, so I'll leave this one there, but I very much look forward to reading more from this author. All Is Not Forgotten is available from 14 July 2016. Thank You to the publishers who approved my request via netgalley.